I have never had to deal with ‘super dry skin woes’ at any point of time in my life as my skin is extremely oily. It’s only in winters that I really pamper my skin with a luxurious pre-bath oil massage, heavy moisturizers and lotions. This winter, I used Skin MD Natural Shielding lotion and it has worked for me. Recently I got an opportunity to try another shielding lotion ‘Gloves in a bottle’. Now I do moisturize my skin minimally during other seasons as well; usually after a shower to lock in the moisture and prevent ‘after-bath dryness.’ So instead of using any other moisturizer, I applied this shielding lotion all over my skin specially concentrating on my neck, elbows, ankles, knees and heels. And a week’s usage has left my skin smooth, soft and glowing. The lotion itself isn’t too thick and gets absorbed into the skin within a matter of seconds. so, you don’t have to use too much of it – just a little goes a long way. Besides this, it is almost odorless, hypoallergenic, non-toxic and not tested on animals. Even though I do not suffer from obsessive compulsive disorder (OCD), I do have a habit of washing my hands frequently. As a result my hands tend to become rough and dry sometimes. 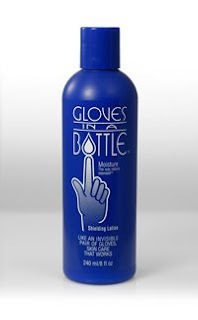 I have found this shielding lotion a perfect solution for my problem. Especially - after I came to know that Gloves in a Bottle is a shielding lotion that rapidly absorbs into, and bonds with, the outer layer of skin creating a protective layer while retaining the natural moisture from within. Moreover, it does not wash off, but comes off naturally with exfoliated skin cells. So you have to just reapply it every four hours for continued protection. It almost works like you are wearing an invisible pair of gloves all day to protect and hydrate your skin for hours. I have been using it for over a week and my hands have become better and smoother. As it is non-sticky and dries off quickly after applying, I can continue with my other tasks right-away. This lotion is just perfect for those housewives that forget to wear gloves while doing the dishes or those healthcare professionals who have to wash their hands repeatedly. To find out more about Gloves In A Bottle and how it helps dry skin, visit the official website. You can also purchase a bottle from here. I have a dry skin and now my skin looks fresh. Is this available in India.I live in Chennai-where do u think i shd look for? I have an extremely dry skin condition specially my calves. I don't think it's available in India. You can however order it online. They do have overseas shipping. I’ve been looking for a good lotion. I’ll have to look for this stuff!! It is very interesting for me to read this post. Thank you for it. I like such themes and everything that is connected to them. I would like to read a bit more on that blog soon. It is certainly interesting for me to read that article. Thanks the author for it. I like such themes and anything that is connected to them. BTW, try to add some images :).